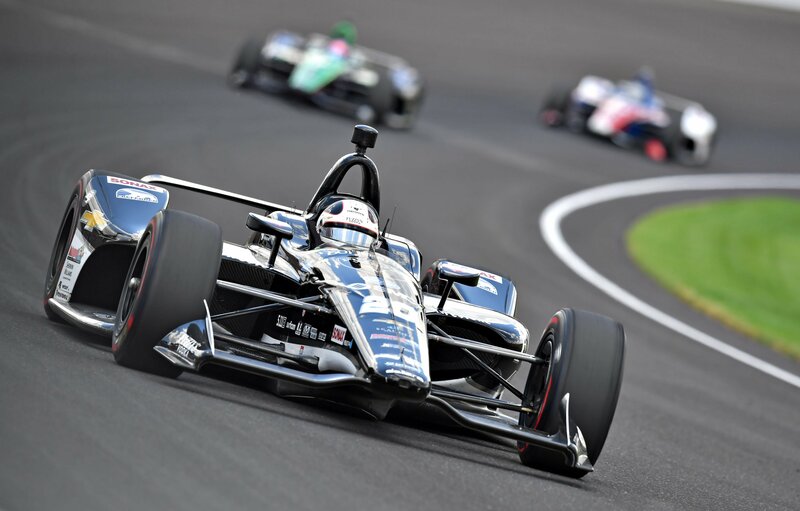 View full 2018 Indy 500 race results below. 13 years ago, Danica Patrick ran her first Indy 500. Topday, Danica Patrick is set to run her final race as a professional racing driver. She’ll do from the 7th starting position. Indycar also debuts a new aero package at Indianapolis. The downforce has been significantly reduced. The cars are new for all at Indianapolis. A flyover from stealth aircraft and 33 cars are ready to go racing. Ed Carpenter and Simon Pagenaud will lead the field to the green flag for the 200 lap, 500-mile race. Green flag, Ed Capenter gets the jump on the inside lane. He leads the field into turn 1. Lap 15, Danica Patrick has lost 5 positions from the start. “Understeer,” she states over the radio. Graham Rahal started 30th, he now runs 23rd, he’s the biggest mover thus far. Lap 25, Carpenter leads by 2.5 seconds. Pit stops are set to begin in the next 10 laps. Lap 30, Danica Patrick is the first car on the pit lane. Ed Carpenter its the pits laps later. As the rest of the field pits, Carpenter cycles back to the lead. He leads Tony Kanaan by 2.5 seconds. Lap 45, the leader is deep in lap traffic. Due to the low downforce package, air is more important. However, when the leader is passing lap cars, the air disappears from the nose. As a result, Kanaan has cut more than a full second off the lead. James Davison is well off the pace, at least 10 mph slower. He’s a roadblock as he awaits an opportunity to hit pit road and make adjustments. Takuma Sato came along and caught him at the wrong time. Sato had his wheel turned all the way to the left. In the wake of his draft, Sato still drifts up the hill and they make right front to left rear contact. Both cars are done for the day. The field returns to the pit lane under caution. Carpenter is first in and first off. Zach Claman De Melo stays on the track. Green, Carpenter sweeps to the inside of Claman De Melo with ease. Kanaan looked to the outside to make it 3 wide, he lifted. Lap 58, trouble at the back. Ed Jones lost it off turn 2. The backend came around and he smacked the outside wall. Lap 68, Danica Patrick is around! It’s the exact same thing that Ed Jones did moments ago. Like Jones, she was running by herself when the back end came around at the exit of turn 2. Patrick was in 17th. Green, Kanaan has a run on the outside! He’s clear! There’s a new leader out of turn 1. Lap 90, pit stops are underway. Lap 92, Carpenter hits the pit lane from the lead. That hands the lead to Will Power. Lap 95, Will Power is in the box. Power comes out ahead of Carpenter! The crew gets it done, Power will cycle back to the lead. Lap 99, Graham Rahal leads. Tony Kanaan is on the pit lane! He has a flat right rear tire. Lap 129, Will Power hits the pit lane. Sebastien Bourdais leads, that’s the first Honda to lead all day. Bourdais heads to the pits. Lap 138, Sebastien Bourdais is around off turn 4! He wiggled off turn 3 behind another car. The car darted to the left, he jolted it back right and almost saved it! However, it then jolted back to the left once more and he looped it through the short straight and slide backwards into turn 4. Green, Will Power leads Ed Carpenter into turn 1. Carpenter had a toe but he lifted early. They had 4 wide down the back for 5th on back. Alexander Rossi just went around 5 cars on the outside through turns 1 and 2! He’s flying, nobody else has pulled these moves for the entire race. Lap 146, Helio Castroneves is around off turn 4! The car just looped around. He backed it into the inside wall just ahead of the pit entrance. “I never had any sign,” Castroneves told ESPN after the spin. Green flag, Alexander Rossi is coming! He started 32nd in this race, 2nd to last. He just rolled the outside to make a pass and move into 3rd position. Nobody has won the Indy 500 from starting that far back. Lap 155, Sage Karam is around off turn 4. “I really don’t know what happened man,” Sage Karam radio. He was running 7th at the time. He almost saved it but he clipped the outside wall with the right rear as the the car drifted sideways off the corner. Green, Power leads by 10 cars lengths off turn 2. Rossi pulls to the outside of Carpenter but Carpenter fights back on the inside to hold the position off turn 2. Tony Kanaan is moving through the field, he runs 9th. They thought about making it 4 wide into turn 3, several lifted. Lap 171, Will Power hits the lane for what should be the final pit stop. Lap 174, Ed Carpenter saved fuel so he could pit late in the final run, he’s in the box. 18 to go, Oriol Servia leads as he’s yet to make his final stop. Power runs 5th ahead of Carptener and Rossi. Servia needs a yellow but he leads by 5 seconds. 12 to go, Tony Kanaan is around! The caution is out. Kanaan wiggled off turn 2. It eventually got away from him as he looped it and spun into the inside wall. Oriol Servia is going to stay out! The team thinks they can make it to the end. However, he’s coasting under caution to save every bit of fuel possible. Green flag with 7 laps to go, Stefan Wilson and Jack Harvey both have a toe on the leader heading into turn 1. They split him! Wilson leads into turn 2. 5 to go, Stefan Wilson and Jack Harvey are both heading for the pit lane under green! Will Power is handed the lead! Power leads Ed Carpenter by 2 seconds. 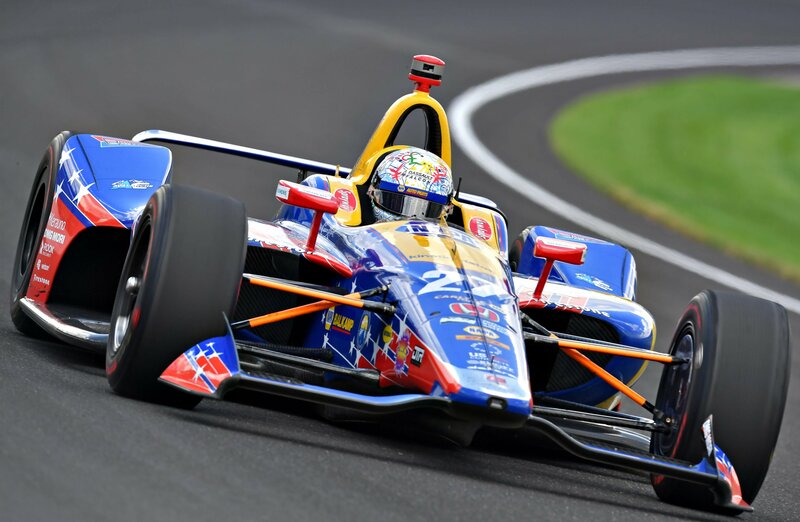 Will Powers wins the 2018 Indy 500 at Indianapolis Motor Speedway! 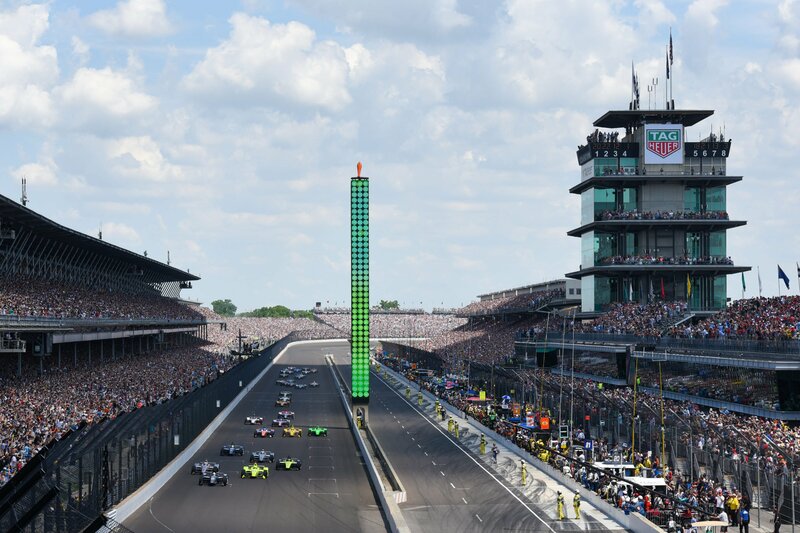 View full 2018 Indianapolis 500 results below.